Czar - 2 year old £17.50 - Plums Apple Trees and Fruit Trees For Sale. Buy at competitive prices with wholesale discounts. A dual purpose plum, Czar is great for cooking and eating straight from the tree. It is one of the most reliable cropping plums and because it is self-fertile it doesn’t require a pollinating partner. 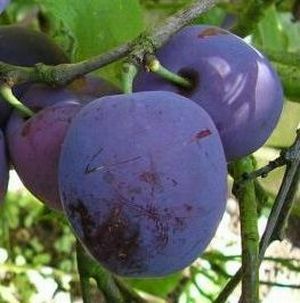 <br> <br> Czar plums are deep purple with yellow green flesh and can be picked from early August. Leave them to hang on the tree to sweeten if using as a dessert plum. A dual purpose plum, Czar is great for cooking and eating straight from the tree. It is one of the most reliable cropping plums and because it is self-fertile it doesn’t require a pollinating partner. Czar plums are deep purple with yellow green flesh and can be picked from early August. Leave them to hang on the tree to sweeten if using as a dessert plum.